Here is a collection of several tutorials and links of tools for molecular data analysis. All tools and applications are free. How to get mRNA and upstream (promoter) sequence of interested gene. How to open DNA sequences in your PC. How to find DNA motif for transcription factor. How to know expression profile of interested gene. How to align two DNA (or amino acid) sequences. How to find domain and motif in protein sequence. 1. How to get mRNA and upstream (promoter) sequence for interested gene. Open "NCBI Gene" page of your interested gene. Ex., mouse Clock. Note. 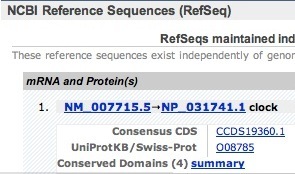 NM, NP, NC and NT indicate RefSeq mRNA, protein, chromosome and genomic contig, respectively. Number following dot means version. Version number can be omitted. If splicing variants were found, the typical variant was listed in the top. Save the sequence by "Send to File". GenBank format is recommended for ApE. There are two options to download genomic sequence from NCBI. Easy to open genomic sequence. Troublesome to expand to upstream. Click on NC_000071.05. And select an appropriate format. Then a part of chromosome sequence was shown. The range is limited to the gene (No upstream sequence). Check the direction of the gene. In this case, the gene was in antisense direction to the chromosome, then "Reverse complemented strand" was checked. To extend the range to upstream, change the number of "Range from 76,641,202 to 76,733,573". If you need 2kb of upstream sequence, change the right box as follows: 76,735,573 + 2000 = 76,735,573. *If the gene is in the sense strand, change the left box as follows: 76,641,202 - 2000 = 76,639,202. Then click the "Refresh" on the right end. Save the sequence by "Send to File". Easy to expand to upstream. Troublesome to open genomic sequence. Click on Map Viewer in the Link list on the right. Then, click "dl" in the map. *Note. The black arrow in the right side of gene name indicate that the gene is in antisense direction to the map. Change the range, Strand and Format to your convenience. In this example, range was expanded to 2kb upstream and 2kb downstream of the gene. The strand and format were changed. Then, click "Change Region/Strand" and save the sequence by "Save to Disk". 2. How to open DNA sequences in your PC. To open and edit DNA sequence, download the ApE. GenBank format is recommended. Compatible to many formats including ABI sequencer. ApE runs in Win, MacOSX and Linux/Unix. Sequence Analysis is also multi-platform freeware to edit DNA files and protein sequences. 3. How to find DNA motif for transcription factor. 4. How to know expression profile of interested gene. Database of Circadian Gene Expression - A good database for mouse and Drosophila. By Dr John Hogenesch and Dr Andy Su. @ Novartis Research Foundation. Microarray Analysis of Circadian Rhythm - A list of NCBI GEO results on clock study. By Hanai @AIST. DBSB - Clock-Controlled Genes in mouse SCN, liver and both. by Dr Hiroki R. Ueda @RIKEN. 5. How to align two DNA (or amino acid) sequences. Use following WEB tools for DNA and protein sequences. Pairwise Sequence Alignment - Alignmnent of DNA and protein. DNA-Protein can be aligned. Use FASTA: ex., mosue Clock → NP_031741. Blast 2 sequences - Alignmnent of DNA and protein. Use plain text, FASTA or Accession Number: ex., mosue Clock → NP_031741. For DNA alignment, download ApE. 6. How to find domain and motif in protein sequence. NCBI CDART - Conserved Domain Architecture Retrieval Tool. Use plain text, FASTA or Accession Number: ex., mosue Clock → NP_031741. SMART - The result is impressive and the scale was fixed. Used for Outline of clock genes. Less sensitive than other tools. InterProScan - Sensitive tool. Cost more time than other tools.